Getting New Tires In Lewis Center? There are so many tire choices in the Lewis Center, Orange, and Flint area, selecting the right one can be a bit overwhelming for Lewis Center auto owners. And even though it’s kind of fun to have new tires on your SUV, they’re a significant investment for most Lewis Center folks so you want do it right. 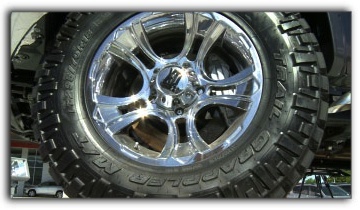 Tip: talk with your friendly Tuffy Tire & Auto Service Center Lewis Center tire professional. He’ll help you sort through the choices. Here are some of the important issues you’ll talk about: One is size – you know, all those numbers on the side of the tire. The right size is important. All new vehicles are required to have stability control which, along with other important safety systems, is calibrated to work with specific tire sizes. Your Lewis Center tire professional can help stay within vehicle manufacturers' specifications or program a different tire size into your SUV’s computer. And you’ll want to discuss how and where you drive in Lewis Center to determine the type of tire you need: summer, winter, all season tires or all-terrain. There are tires for every Lewis Center auto owner's needs. Like we said, tires are a big investment, so you want to get a good value on tires. Now that doesn’t always mean the cheapest tire. A top tier tire from Tuffy Tire & Auto Service Center Lewis Center will last a long time and give Lewis Center drivers good performance throughout its life. Tires sold in Lewis Center bargain tire shops may not live up to that promise. Again, your friendly Tuffy Tire & Auto Service Center Lewis Center tire professional can give you options that offer the best long-term value within your immediate budget. Last, with a 2-wheel drive vehicle, it's critical to always replace both tires on an axle. Modern sensors and computer safety systems for SUV brakes, stability and traction control need both tires to have the same amount of wear to work properly. And always put the new tires on the rear so you don’t fishtail in a turn. With all-wheel drive you should replace all four tires at the same time. Schedule a tire inspection at Tuffy Tire & Auto Service Center Lewis Center to see how much life is left in your SUV tires and seek the help of a professional when choosing new shoes for your vehicle.